If you’re getting ready for a St. Patrick’s Day celebration, you’ll love the ideas in this post! 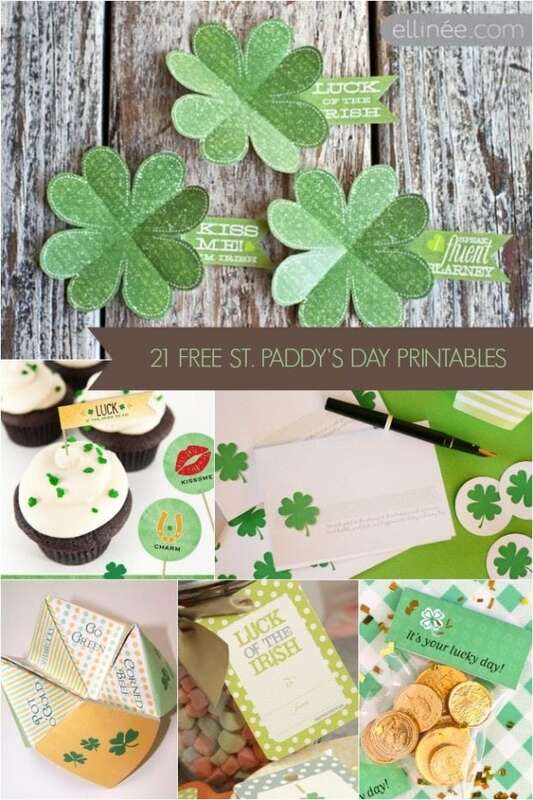 I’ve gathered 21 awesome St. Patrick’s Day themed printables. The round up includes artwork, cards, and even some party supplies. Even better: everything is boy friendly. Enjoy! With this adorable printable, you’ll have finally found that pot at the end of the rainbow! Fill up containers with your choice of rainbow jellybeans, cake, or candies for a fun and festive treat. Attach these printables for a fun party favor or maybe to hand out in a classroom. For those that may not have any green in their closet, these signs will come in handy as the day of pinches approaches. Put these signs up to ensure your safety! Simply print one out and pop it in a frame or post it on the wall somewhere. This way you’ll be able to enjoy the holiday with no worries about the next time you’ll get pinched. Make even the little things stand out at your St. Patrick’s Day party! Ensure your drinks are just as festive as the rest of your party with these free printable water bottle labels. Just print and wrap them around the bottled or canned drinks you’re serving. Who wouldn’t love to find these delicious treats at the end of the rainbow? Add a little humor onto your dessert table with these Instagram-themed rice treats. All of the little logos and decorations are free and printable, so no worries about creating everything. All you’ll need to make is the actual dessert then stick these on for some holiday fun! Don’t leave your cupcakes boring! Why settle for simple green frosting when you can take it up a notch? Pop these cupcake toppers right on top for some festive fun. These free printables have a few different St. Patrick’s Day themed phrases that are perfect for any party. Give these out to friends and family to save them from the impending pinches they may get for not wearing green! Print these out and pop a festive green accessory on for them to wear. It could be as simple as a green string bracelet. If you’re feeling crafty, try and attempt the green bracelet made from loom bands. Make your cupcakes the center of your party’s dessert table with these fun toppers. Make your friends into little leprechauns with this printable! It’s sure to make them laugh when they arrive and see what you’ve done. If you’re short on time, just print the shamrocks and pop them on top instead. Still festive and super simple! These cake toppers come in a variety of different designs to keep your holiday interesting. With a few of the quintessential St. Patrick’s Day phrases, these cupcake toppers are perfect. Stick them right on top of a cupcake to make it festively fun for the holiday. This free printable can be used in a variety of ways! From cupcake topper to pins to hat decorations, this printable can be whatever you need it to be. If you’re in search of something green and need to find it quick, this is for you! Use these adorably designed printables for decorations on party favors. You could also print them out and make them into cute cupcake toppers! Whatever way you use them, they’re sure to be festive and adorable! Use these free bag tags to create some fun party favors! Find some festive party favor bags and fill them up with gold coins and tasty treats. Once the tags are printed, attach them to the bag with some green or gold ribbon. Everyone will be sure to know what this holiday is all about when they see this hanging in your home. This lucky banner is the perfect solution to a bare wall or mantel in need of decoration for the March holiday. Not only is it free, but it’s also amazingly easy to put together. Simply take the banner pieces and hang them up with some string. It can’t get much easier! These gift tags are adorable for the green holiday! Print these out for a fun favor or sweet gift. Attach them to some of your favorite rainbow treats such as marshmallows or jellybeans and you’ve got an easy gift on your hands. For a fun and easy St. Patrick’s Day party favor, try this idea out. Once you’ve got your party favor bag put together with some golden-wrapped candy, stick these tags on. There’s one for everyone from teachers to spouses. Pick the perfect tag and get to giving! Make this paper shamrock a hair accessory or wear it somewhere else. With this green paper accessory you definitely won’t get pinched. You can put this together in no time, so there’s no reason not to. Better be safe than sorry! If you’re in need of a little more home decor for the month of March, try these out. Pick your favorite festive sign for a party or if you’re just in need of a little more green this month. Put them in a picture frame or hang them on your wall for an easy decoration! If you’re looking for a little something extra for your St. Patrick’s Day party, this is where to look! There’s tons of different designs that are all perfect for the upcoming holiday. Pick your favorite and frame it for some easy-to-make home decor. This cool piece of art has all of the things you think of when it comes to the March holiday. Festive and green, this would look great in a frame. Print this out for some easy and quick decoration. Though the main focus is on the green, one can’t forget about rainbows this St. Patrick’s Day! This cute printable comes in different sizes for a fun and easy to put together decoration. Adorn this printable in a frame with a cutesy ribbon shamrock to make it even more festive! If you want to spread a little cheer this St. Patrick’s Day, print this out and pass it to your favorite people. This free printable is a card that includes everything you need to make it fun and festive. It includes the decorations and the quote that goes inside so all you’ll need to do is add a little personalization. Make someone’s day brighter with this friendly card! Not only fun for kids, but adults can have fun with these too! Print these out and get ready to be the fortune teller this St. Patrick’s Day with this easy printable. Pass these around at your party and see what Irish-themed fortune you get. Create a magical treat this St. Patrick’s Day with these great sources gathered by crew at Spaceships and Laser Beams. Kids will love these St. Patrick’s Day themed ideas.